Baby back ribs are a quintessential summertime meal. Baby back ribs are meaty pork ribs taken from the lower back of the pig. They're a staple of backyard cookouts, Fourth of July parties and tailgate grilling. Baby back ribs can be marinated in sauce or rubbed with spices before baking or grilling. Baby back ribs are typically served with potato salad, coleslaw and other cookout sides, but those are by no means the only menu possibilities. The Alan's Kitchen website gives a new spin on the classic combination of pork and apples by pairing baby back ribs with a golden apple salad, sweet and sour coleslaw, cornbread and a spicy applesauce cake made with cinnamon. The site suggests a fruity homemade sangria topped with fresh mint as a light complement to this summertime meal. "Sunset" magazine recommends pairing baby back ribs with a nice Zinfandel and suggests a menu built almost entirely around the fruity and peppery notes in the wine. The magazine's baby back herb rub consists of pepper, paprika, thyme and salt while the cherry-Zinfandel barbecue sauce adds a fruity tang with its varied ingredients of olive oil, onion, garlic, ketchup, cider vinegar, Worcestershire sauce, brown sugar, Dijon mustard, ginger, pepper, anise, cayenne and lemon juice. Fennel-pepper slaw and chocolate-chip shortcakes with berries and dark chocolate sauce round out the wine-based menu. 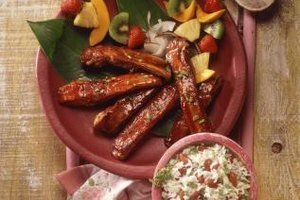 Cristina Ferrare shares her baby back rib menu on the Oprah.com website. Ferrare's take on ribs is a slow seven-hour roast in the oven so that the meat falls off the bone. Ferrare serves the ribs with a traditional dish of barbecue beans baked in onions, mustard and molasses topped with bacon slices. She pairs the side with skillet cornbread, grilled corn with lime butter and a watermelon salad for dessert. Chef Luke Palladino, Atlantic City restaurateur, approaches baby back ribs in a completely different way. He starts with two racks of baby back ribs, stuffs them with sausage then rolls them up like a jelly roll. He coats the outside of the rib roast in a cream and herb mixture then roasts it in the oven for two hours. At the end of that time, he removes it from the oven, coats it in a honey-based sauce and puts it in back into the oven to glaze for about 10 minutes. Once done, he serves it on a bed of polenta. He pairs this with a roasted endive and fennel salad, along with a ricotta panna cotta brulee for dessert made with vanilla, almond extract, cream cheese and ricotta. For a classic baby back rib feast, bake a pan of cornbread and whip up some creamy coleslaw. Shred a head of green cabbage, about one-quarter head red cabbage and a few carrots. Stir together with bottled creamy coleslaw dressing to taste, and let stand for an hour or so, if desired, for the tangy flavors to mingle. Top off the meal with apple pie and ice cream.